Where are your air filters located in your home? Most central heating and air conditioning systems locate the air filter housing as close to the blower unit as possible in the return air duct. Air filtration happens as the blower draws air through the filter and feeds it into the furnace or AC unit for conditioning and circulation. The grill or box cover over the opening that contains the air filter should be located on the wall nearest to wherever the furnace is mounted, on the opposite side of the wall as the furnace. If not there, the HVAC air filters may be located inside, or on the air handler itself. How do I find out my furnace filter size? 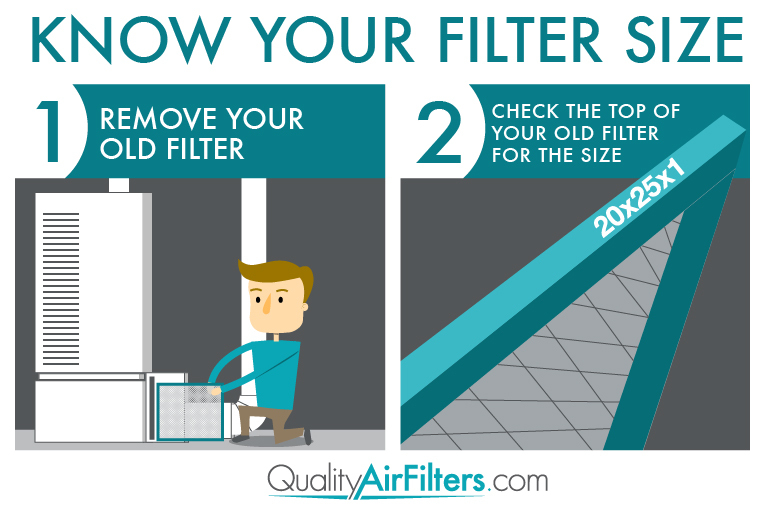 Before knowing how to change air filters in house, it's important to know your exact filter size. The opening behind the grate covering the furnace filter will typically be a basic square or rectangle shape. AC filter sizes will vary. Your air vent filter size should match exactly to slightly smaller than the measured outside length and width of the frame around that opening. This is vital as mismatched HVAC filters can allow harmful particles such as pollen, dust mites, mold spores, pet dander, tobacco smoke and other contaminants to enter your house. Having an incorrect filter size is like not using a filter at all, which can have a bigger impact on your furnace and AC systems. Actual filter size is the critical dimension to measure and shop for. Most air vent filters match exactly with the size of the opening. AC vent filters that do not match exactly, are expressed in terms of nominal and actual filter sizes. Nominal filter size is the approximate size of the filter rounded up to the nearest whole inch. For example, a filter that measures 19 ⅝” x 19 ⅝” x 13/16” might be nominally labelled as 20 x 20 x 1. 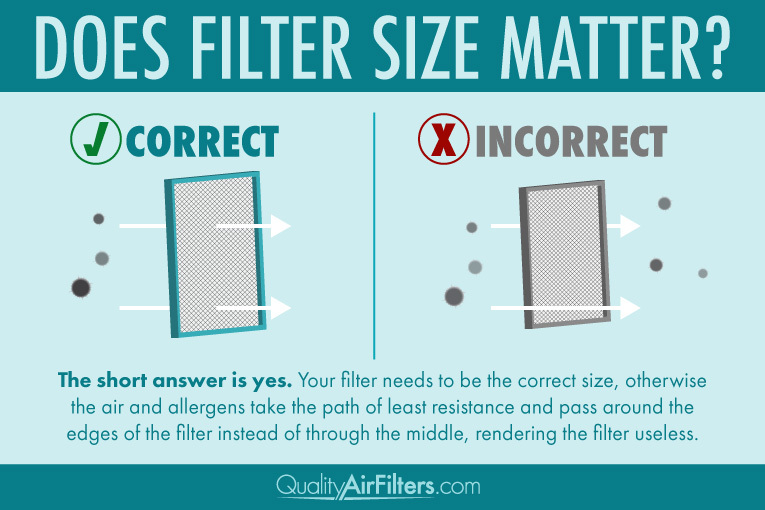 Need help figuring out your air filter size? Pull out your current filter and look on its side. Dimensions range from 10”x10” to 30”X36” and most, but not all filters are 1” thick, though some homes will have 2”-5” thick filters. What sizes does Quality Air Filters have? Some systems require eccentric shaped, and/or oddly sized air filters for HVAC. Quality Air Filters stocks 75 standard sized air filters, and can make custom air filters to any size desired. The best part is that there is no minimum quantity requirement for custom orders. You can order just one custom air filter if that’s all you need. Additionally, Quality Air Filters can create custom delivery schedules that vary from just a one time order to every 2-6 months that best suit your air filter needs. Does my filter have to be an exact fit? Ideally, you want the vent filter to fit as close to exact as possible. If a filter is not fitted snugly, unfiltered air will go through the path of least resistance, and the filter will be rendered partially if not completely useless. Particles that bypass the filter may build up on the mechanical parts of furnaces, and AC units, and deteriorate proper mechanical working conditions over time. Left unattended this creates the need for expensive repairs, parts replacements, or in extreme cases total replacement of the unit. It’s important that everyone changes their air filters on a regular basis. From decreasing your electric bill to improving the efficiency of your HVAC system, by regularly changing your house's air filters with the right size, the higher quality of air you’ll have circulating through your home. Learn more about how QualityAirFilters.com can help you keep your house in great condition by ordering furnace filters online and have them delivered right to your door. How do I change my filter? Sign up to get the best tips and news QualityAirFilters.